Collectivity is almost universally recognized, and celebrated, as a cornerstone of improvised music. Group interaction onstage is itself a crucial feature for listeners; how materials and events emerge from socially situated actions and reactions between performers is often viewed as at least as important as the sounds and sound-forms that they produce (Monson 1996; Fischlin and Heble 2004; Haenisch 2011). 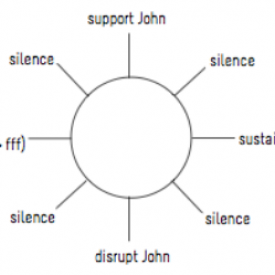 The values that underlie and evolve through these interactions (MacDonald and Wilson 2005) can anchor communities that form around improvised music; the notion of improvisation as a “practice of conversing as equals” (Nicholls 2012, 114), in which difference is both interrogated and respected, has often been cited as an instantiation of and a model for self-determination and social change (Fischlin and Heble 2004; Lewis 2008; Prévost 2009; Born 2017). Yet music by a number of improvisers who use notation does in fact privilege and make an essential feature of collectivity. All of the artists included in Tactile Paths, as well as others such as Anthony Braxton, Chris Burns, Barry Guy, George E. Lewis, Misha Mengelberg, Pauline Oliveros, Polwechsel, Wadada Leo Smith, and John Zorn, are among them. In this music, both the non-hierarchical interaction of the group and the practice of scoring enable musical experiences that are unthinkable through only one method or the other. Furthermore, some of these artists owe the development of their work in large part to their participation in formal collectives and tightly knit musical communities: Braxton, Lewis, and Smith are lifelong members of the Chicago-based AACM (see Lewis 2008); Cardew was a member of the seminal ensemble AMM and a founder of the Scratch Orchestra (see Cardew 1969); and Zorn remains an emblematic figure of the “downtown” NY scene which blossomed in the early 1980s (see Lewis 1996 and Brackett 2010). Empirically speaking, notation and the “liberatory political model” of improvisation do not seem fundamentally opposed to each other after all. But the above statements by Born and Nicholls do raise important questions. What is the value of notation for collective improvisation, exactly? How does notation construct, destruct, deconstruct, or reconstruct improvisers’ relationships to each other? What does notation for improvisers say about collective improvisation in the world, about “the individual as a part of global humanity” (Lewis 1996, 110)? Score + Response = Collaboration = Liberation. In the following text I will explore the particulars of this proposal in the context of their own work and see how it holds up. 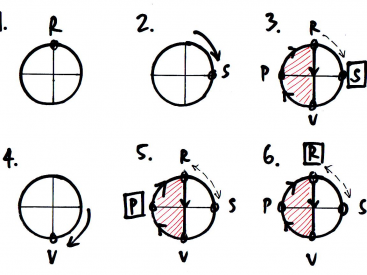 The RSVP Cycles: Creative Processes in the Human Environment (Halprin 1969) is somewhere between a theory, a manifesto, and a metascore for score-based collaboration by Lawrence Halprin. Though not listed as an author, his wife and collaborator Anna Halprin, reluctant godmother of the postmodern movement in dance, was also deeply involved in the publication – and remains, at age 96, an exponent of its principles (Worth and Poyner 2004). Due largely to the confluence of the Halprins’ backgrounds, the book is explicitly interdisciplinary in nature. As Liana Gergely has argued in her 2013 study of Anna Halprin’s historic dance piece Ceremony of Us (1969), the cycles’ processual nature makes them ostensibly applicable to any field. This is reflected in the diversity of its abundant exemplary material; this “outrageous and seductive scrapbook of cherished images” (Kupper 1971) contains “scores” ranging from Hopi petroglyphs and player piano rolls to American football plays and vegetation maps. Here I would like to explore the model’s creative and theoretical relevance to notation for improvisers. My primary motivation for doing so is Lawrence Halprin’s focus on the collective element, which, as I claim above, is a basic facet of musical improvisation. But over and above this general connection, Halprin’s book resonates with Tactile Paths in not aiming to circumscribe notation from the outside; rather, in the vein of Patterson’s Variations for Double-Bass, it stimulates speculative reflection to be acted upon. As Halprin states, the “RSVP Cycles and the point of scoring are not meant to categorize or organize, but to free the creative process by making the process visible” (1969, 3). In my following exposition of the RSVP cycle, I will concentrate on those aspects of the model that bear out Halprin’s claim, with an eye on its applicability to a series of pieces by Richard Barrett entitled fOKT (2005). According to Halprin, The RSVP Cycles3 began “as an exploration of scores and the interrelationships between scoring in the various fields of art” (Halprin 1969, 1). However, reconsidering the importance of preparation and context for score production led Halprin ultimately to examine “nothing less than the creative process – what energizes it – how it functions – and how its universal aspects can have implications for all our fields” (2). The RSVP Cycles therefore do not model the practice of scoring per se, but rather the collaborative production and use of scores. Resources which are what you have to work with. These include human and physical resources and their motivation and aims. Scores which describe the process leading to performance. Valuaction which analyzes the results of action and possible selectivity and actions. The term “valuaction” is coined to suggest the action-oriented as well as the decision-oriented aspects of V in the cycle. Performance which is the resultant of scores and is the “style of the process”. (R) Need for food → (P). Hunting. No score no art process. (R) Need for food → (S) → (P). Hunting Ritual. Ritualize i.e., score (art process). (R) Need for shelter → (P) House. No score no art process. There are many interrelationships and weightings of the cycle but the major configurations are as follows: these describe the relationship during performance (P), not during the scoring itself or what has led up to the score. 1. 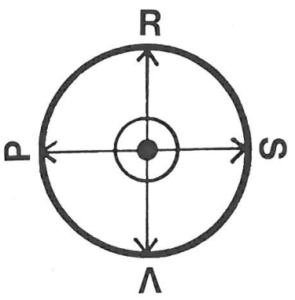 (S)→ (VPR): Closed score for complete control – score as vehicle – as precise as possible to accomplish a mission. 3. (PRS): Some control, very little feedback or selectivity during performance. It hardly seems necessary to point out the holes in this assessment, but let me a list a few for the sake of argument. First, Halprin ignores the role of history; neither changes to the score through centuries of editing (particularly Klee’s own renotation) nor the improvisatory aspects of baroque performance practice such as ornamentation are taken into account. Second, he imposes a modern work-based view of the score (i.e. as a transparent representation of the composer’s intentions) onto a practice which existed over a hundred years before this model even appeared (see Goehr 1992). Third, he erases the agency of the performer entirely, comparing her to the mechanism of a player piano: “The ultimate development of this kind of controlling musical score in which the performer is a medium, is the punched rolls used in player pianos” (13). In fact, he maps both the Bach and player piano examples identically as (S) → (VPR): “controlling”. How can Halprin’s reading account for the fact that Bach’s music was partly copied by his wife, Anna Magdalena Bach? Or for wide differences between performances of the Bach cello suites by – as just an example – Pablo Casals, Mstislav Rostropovich, and Anner Bylsma? Needless to say, this is not a fair representation of Bach’s score or its performance. His discussion of Serenade II Janice Wentworth (Halprin 1969, 14-15), a series of graphic scores for indeterminate performer (musical or otherwise) by composer Charles Amirkhanian, is only slightly less problematic. “The scores indicate,” according to Halprin, “how the new music has influenced the scoring technique, and the score itself has responded to the requirements of the music as an open environmental event” (14). This description is justified by Amirkhanian’s subsequent list of possible interpretations by a percussionist, a painter, or a theatrical director; all performers use the score’s unexplained symbols as stimuli to unprescribed actions within the framework of their respective tools and skill sets. Halprin contrasts this “openness” to Bach, but rather incongruously maps Serenade as (S) → (P): “energizing”. Energize it does, but where is the (V) of the performers’ fundamental decisions regarding the score’s indeterminate aspects? Valuaction seems to be the crux of his distinction between the two musical examples, but it is not articulated. In both of these cases, Halprin sells his cycle short. He only considers what the score itself denotes – from an underinformed point of view, at that – and not the life of the score in the world that his own model makes visible. For example, his application of the same mapping type to Bach and Labanotation (a choreographic scoring system used in ballet and modern dance, 40) obscures the fact that the latter is used to record pieces after they are composed and performed, whereas the former is a medium of communication with the performer before performance. One objectively transcribes, the other subjectively inscribes. 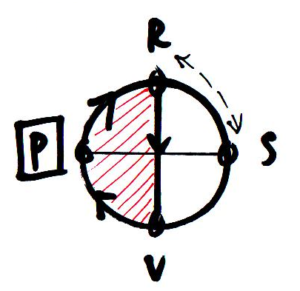 Halprin’s own diagram has the potential to show this difference: he would simply need to trace a longer trajectory through the circle such as (R) → (P) ↔ (V) → (S) for the first performance of a choreography and its transcription into Labanotation, then (S) → (V) → (P) for subsequent performances. In the case of Bach, he might have included feedback between (V) and (R) to show that the performer is also in dialogue with the resources of performance practice, instrumental technique, and the perpetually evolving identities of the works that the score (partially) represents. In a similar way, the reductive examples of the Bach and Amirkhanian scores forego opportunities to highlight surprising similarities between them. Going past the first iteration of the cycle – a single hypothetical performance – might show, for instance, that repeated performances of Bach (P) constitute a personal history with the piece (R) that a performer may consciously vary or improve (V) over time. Such change would reflect an opening in the process of interpretation, which Amirkhanian’s score shares. This oversight is all the more surprising given Halprin’s repeated emphasis on the temporal process: “The element of time,” he says, “is always present in scores. Scores are not static; they extend over time” (190). In sum, Halprin’s analyses of music – and of others’ work in general – tend not to do justice to his model. But all is not lost. One gets a much richer sense of the potential of the cycles from the documentation of Halprin’s own collaborative projects, in which the entire R-S-V-P sequence is consciously deployed as a creative method. An excellent example is The Sea Ranch (Halprin 1969, 122-155), an ecological planned community in northern California, whose masterplan Halprin oversaw in the early 1960s. Although Halprin does not map the project’s evolution explicitly onto the RSVP Cycle, his annotated photos, scores, and allusions to the cycle in particular stages make it possible, with the help of secondary literature on the project, for others to infer its workings. I will now unpack this robust example of the cycle in order to offer the reader a more charitable view of the dynamics of Halprin’s model. In addition to illuminating the structure of the model, I hope my explanation supports Halprin’s claim that the book itself is a score (Halprin 1969, “Acknowledgements”), and “[f]or a score to function the participants in a score must exhibit a commitment to the idea of scoring and be willing to ‘go with’ the specific score” (190). In other words, rather than apply the model as a finished, self-contained system, I will improvise with it in an attempt at a temporally distributed theoretical collaboration. For purposes of structural clarity, I will proceed in outline form rather than in narrative prose. Commission by owners and developers: “Oceanic Properties, a subsidiary of the Hawaiian developer Castle & Cook, selected Halprin to oversee the master plan for a second-home community” (John-Alder 2014, 55). Team included cultural geographer Richard Reynolds (John-Alder 2014, 55); San Francisco Bay Area-based architect Joseph Esherick; Berkeley-based architecture firm Moore Lyndon Turnbull Whitaker (Canty 2004, 23); and “a then unprecedented wide range of disciplines: foresters, grasslands advisors, engineers, attorneys, hydrologists, climatologists, geologists, geographers, and public relations and marketing people” (Canty 2004, 23). Natural conditions of the site: undeveloped coastal land 120 miles north of San Francisco near the San Andreas fault; cool, damp, windy climate; active ocean; rolling meadows; patches of redwood forest. Inspiration by local architecture, especially “timber framing of local barns” along the Coast Highway (Lyndon 2009, 84). 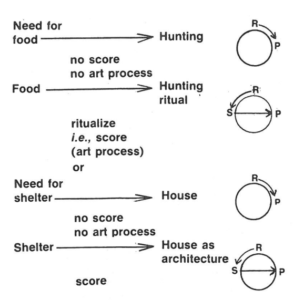 Explicit wish to work with ecological scoring (Halprin 1969, 117). A “feeling that this area could be a prototype of how man could plan development with nature rather than ignore her” (Halprin 1969, 117). Site study: “A year of careful ecological studies revealed a great deal about the land that was not apparent from the start” (Halprin 1969, 117-118). Reynolds measured wind and other meteorological conditions of area (John-Alder 2014, 55). “Up in the woods forestry practice was studied at length” (Halprin 1969, 118). Vegetation and soil (Halprin 1969, 125). “A careful logging program” and “a carefully organized program of controlled burns” to rehabilitate the nearby redwood forests (118). “Resource analysis” (Halprin 1969, 124) – reevaluation of (R) before proceeding with development planning. Example: “the cool, damp climate was outside the human comfort zone. The data also indicated that wind was the most easily controlled climate variable” (John-Alder 2014, 56). “Thematic early scores” (Halprin 1969, 130): development sketches (130-131). Visual descriptions of architectural principles to cope with wind and dampness: slanted roofs, placing buildings adjacent to hedgerows (135). Visual descriptions of urban planning principles to foster community living: condominiums and clustered housing (141). Primary purpose NOT to prescribe unilateral action (as blueprint) and preserve instrumental data about the environment for construction. RATHER to provide points for discussion among collaborators about how to integrate the development with the environment as a whole: “Taking particular elements and scoring alternatives as test runs to disclose options and allow for valuaction and selectivity to operate” (124). “Concept Alternatives” (Halprin 1969, 132): a grid mapping the aesthetic, social, and structural aspects of various building options, for discussion. “Followed hard on the heels of thematic scores and made selections between various alternatives based on values and congruence with motivations. Feedback between V and scores was continuous during this period” (124). Not only filtered scores for implementation in performance, but also catalyzed new scores. “Location score” (Halprin 1969, 132), featuring urban policy proposals, “establishes major ‘lines of action’ for performers to follow” (138). Would later, after subsequent iterations of (V), be used as the basis for actual construction plans submitted to the property owners (141). Same time phase as 7b. Reflective tool for future consideration. Construction of first phase of development. Construction (P) led to salable product (R). Unexpectedly high demand: “The place took on a special cachet. Oceanic had helped to sell one hundred lots the first year but met its goal in just over eight months.” (Canty 2004, 29). Subsequent developments did not reflect principles of Halprin, his collaborators, and their scores. 1. The score was not visible enough to everyone involved. 2. Some of the score was kept secret because it was not completely agreed upon by management. For example, public access to beaches and the idea of varied income. This did not really turn out to be a balanced community in terms of income levels, which is what it was intended to be. 3. All the principles of the score were not understood thoroughly. For example, the notion of tight-housing clusters of various configurations was not really visualized by the sales force. 4. Early sales management groups were disbanded, and the second wave had not been involved in the score and subsequently did not really understand it. What can we learn about scores and collective improvisation from the example of The Sea Ranch? What does it tell us about the relevance of the RSVP cycles to notation for improvisers? An ecological approach is suited to scores for improvisers because it shows their participation within this co-evolution, rather than their prescription or preservation of it from the outside. We must not begin at (S) and proceed directly to (P) – with an optional path through (V), interpretation and rehearsal – as would be suggested by some linear models of notation and performance (Boulez 1990, 87; Nattiez 1990, 17). The cycle may start anywhere and move in any direction; thus it accommodates how notation emerges and feeds back on ongoing improvisational practices (see “Entextualization and Preparation in Patterson’s Variations for Double-Bass“); how it changes and is changed through use (see “A Treatise Remix Handbook”); and its growth over longer periods of time – what precedes and follows an initial inscription and single performances (see the Bach example above). A second related point is that scores and collectives are mutually influential, but ultimately independent of one another. On a positive note, the collaborative aspect of work is present in the model even when the participants, such as a composer of written texts and an instrumental performer, do not work together personally. The cycle can be shared and distributed among many parties over time and space, and the continuity and contingency of the work-as-verb is still manifest – whether this occurs between J.S. Bach, Anna Magdalena Bach, and Pablo Casals; or between Halprin, Barrett, and me. However this point reveals a potentially problematic side to notation for collective improvisation. As we see in point (10) of my mapping of The Sea Ranch project, collectives and scores tend to evolve on their own terms, and neither one can sustain the other. Group personnel, performance practices, and interest in particular scores inevitably drift; scores may only make sense in a particular constellation, or lose value after having been played only once. If a given project is inherently temporary – as in the case of Richard Barrett’s fOKT series – this may not be a problem, and even an asset. But as in the case of The Sea Ranch, the sustainability of ambitious long-term projects may be compromised or crippled by the very contingency that animates them. 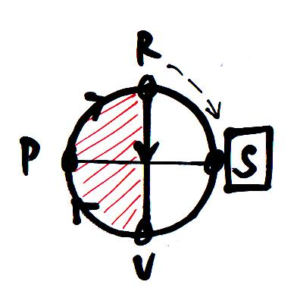 A third relevant aspect of Halprin’s model is the (V) element, valuaction, “which analyzes the results of action and possible selectivity and actions. The term ‘valuaction’ is coined to suggest the action-oriented as well as the decision-oriented aspects of V in the cycle” (Halprin 1969, 2). It “incorporates change based on feedback and selectivity, including decisions” (191). What might valuaction mean in the context of notation for improvisers? On the one hand, it may surface in processes of criticism, revision, and verbal negotiation among collaborators as we see in The Sea Ranch project. Ideas are inventoried; a score is produced; it is discussed and edited (V); fundamental assumptions and materials are reconsidered; the score is revised; the project is performed; the results are discussed again (V); and perhaps they lead to subsequent scores and performances. This is very much the case in A Treatise Remix: I studied the score of Treatise and its performance history; collected recordings and edited them into a collage; presented my collage and ideas about the score to my collaborators; discussed, rehearsed, and revised my plans with them (V); performed with them in the studio; made adjustments to the plan in the studio according to the input of my producer and sound engineer (V); assembled the live recordings with the collage in sometimes unpredictable ways; added unplanned material and erased planned material; and then returned to the studio for the final mix. This sense of valuaction is, in fact, nothing special; it inheres to virtually any workflow that admits even a modicum of change and diversity. Östersjö’s last point – that thinking-through-performance, or nonverbal valuaction, can continue into the performance itself – is especially significant to improvisation, where evaluation-and-action during the course of performance are not only possible, but mandatory to the performance’s very continuation. The musician hears as she plays as she hears, but this is not an unmediated flow; she might make mistakes, she interacts with one sound or player and not another, she feels ambivalence about when to end or not. These are all instances of evaluations that lead to action, and they are inherent to the activity of the improviser during performance. That Halprin’s model gives (V) the same hypothetical importance as all the other elements in the cycle underlines its proximity to the practice of improvised music. The cycle thus allows us to focus on workflows unique to particular projects or performances. It not only generically frees us from problematic conceptual binaries, but also provides a view of what specifically emerges in its place on a case by case basis. This aspect of Halprin’s model may have had its roots in the social structure of his profession. As a landscape architect, Halprin would never – indeed could never – have operated as solitary author, or considered his collaborators as executants. He was constantly required to negotiate with other architects, investors, politicians, urban planners, climatologists, geographers, engineers, contractors, and (sometimes) even ordinary citizens, and his work changed drastically in the process. We remember that, for better or worse, the RSVP cycle bound him with The Sea Ranch architects, engineers, planners, et al in a dynamic process together. Ironically, Halprin’s very faith in the transformative power of “the newer ‘open’ scoring” (175) – particularly that of his own model – reveals its Achilles’ heel. While the RSVP cycle privileges collective dynamics over a top-down chain of command, it also fails to represent the fact that not all participants necessarily have an equal say in the process. Halprin’s dismissal from The Sea Ranch project by managers at Oceanic brings this point home bitterly.4 The owners’ unilateral abandonment of the development’s founding ecological principles reminds us that nominal collectivity in notation is no guarantee of symmetrical power relationships or real collaboration.5 Even if the score had been more visible to Oceanic, as Halprin wished in his last valuaction (1969, 146), it is unlikely that The Sea Ranch’s corporate owners would have held the score’s principles in higher esteem than their own bottom line. Score + Response = Collaboration ≠ Liberation. As ever, one must look beyond notation to the contingent particulars of its use. Apropos, let us now turn to the music of Richard Barrett, and explore his concrete use of notation for improvisers in the framework of the RSVP cycles. A brief introduction to Barrett’s unique artistic trajectory will help us situate his work. In contrast to many artists working with notation for improvisers, Barrett has been active at the extremes of “straight” new music and experimental improvised music for most of his career. His catalog of through-composed chamber, orchestral, and electronic music includes over 120 pieces; they have been played by some of the most prestigious soloists and ensembles in the field. Since the mid-1980s, he has also frequently performed as an improviser on electronics. Of particular importance in this vein have been his long-term collaboration with Paul Obermayer in the duo FURT and his work with the Evan Parker Electroacoustic Ensemble. Recent performances and recordings in trio with violinist Jon Rose and contrabassist Meinrad Kneer, and in the Belgrade-based collective Studio6, round out the picture. His work in both areas shares many aesthetic traits: rhythmic irregularity and hyperactivity; dense, intricate textures; constant shifts of pacing and perspective; and precise, jagged formal architectures. However, until the late 1990s his public activities as a “composer” and as an “improviser”7 were surprisingly discontinuous, if not to say mutually exclusive. On the one hand, his through-composed music from this time employs elaborate conventional notation, noteworthy for its rhythmic and timbral complexity and technical virtuosity. The scores’ high information content indexes Barrett’s use of post-serial mathematical and scientific models that often affect every parameter of musical expression. Superimposed indications relating to timbre, articulation, dynamics, rhythm, and gesture sometimes contradict each other, producing “ambiguities, imperfections, contradictions, and so on, which constitute what might be called the ‘poetry’ of notation” (Barrett 2002b). One may surmise that notation is essential to the creative process in these pieces both for the structural precision it enables at the compositional level and for its unpredictable effects on performance. Thus, one may gather that, in the era before he worked with notation for improvisers, Barrett’s moment-centered view of the structural-expressive framework of improvisation included collaborative relationships developed over time. 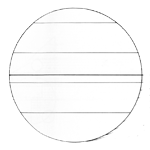 With transmission IV (1999), the fourth of six movements for solo stereo electric guitar and electronics, these two strands of Barrett’s musical life began to intertwine on the page. The score looks much like its through-composed antecedents, with one major exception: between the densely notated fragments, the guitarist may improvise. an experiment in collective musical creativity of which Cardew was a founder member and whose aesthetic identity was to a great extent defined by The Great Learning. This work consists of seven paragraphs corresponding to the division of the original text, and the longest of these is Paragraph 5 […]. The second half of Paragraph 5 is a free improvisation […]. Regarding this point, we see a number of clear connections to Halprin’s motivation for developing the RSVP cycles. Both Barrett and Halprin take pains to distinguish their views from chaos and anarchy; both emphasize the responsibility of participants; and both caution against the destructive potential of determining results in advance of the process. In many ways, their ideas on the nature and power of notation in collective creativity fit hand in glove. (1) My personal experience of listening to contemporary music is that, with few exceptions, the art of composition, as it is “understood” by the institutions which purportedly exist to promote and nurture it, is moribund in comparison with what is being achieved and developed in the context of improvisation. (2) I believe this exhaustion in the world of composition has straightforwardly political roots in the way that the accepted social model of this art mirrors the structure of the society which generates it, that is to say, it is characterised by dehumanising economic/power relations. It is therefore no wonder that composers (to name only these) seem to have only two choices before them: to capitulate to commercial interests and become small-business entrepreneurs in the music industry, or to turn inwards, towards a “group-solipsism” where they and their peers can convince each other that their creative impoverishment is actually something vital and significant. I feel it is necessary to reject both of these standpoints as different forms of fin-de-siècle pessimism, neither of which can produce a visionary art worthy of the potential of human imagination and intelligence. Despite the overall acrimony of this text, Barrett presents a ray of hope in point (3) that brings us back to the proposal I outlined in the introduction to this chapter: “a question, to be answered by its performer(s)” – an invitation to collaborate on something in particular. By conditioning the open-ended processes in his notation for improvisers with a “precisely imagined common point of departure” (Barrett 2011, 1), or “seeding” them (see Barrett 2014), he goes a step further than clutching at straws. He takes responsibility for his authorship – making his own position visible – and addresses what I consider to be the major problem with the RSVP cycles: its failure to represent power relationships. A long, intensive rehearsal period meant the score would not need to be comprehensive; there would be plenty of time for personal communication and experimentation. The score(s) would need to be written in a way that Minton and Lovens would respond to – i.e. not in conventional notation – if they were expected to pay it any heed. The players would all bring their diverse, idiosyncratic methods and sound worlds to the piece. The ensemble would therefore not only passively extend FURT’s history and identity, but also actively transform and potentially confront it. The first three scores for fORCH, fOKT I-III (2005), were prepared by Barrett before the week of rehearsal in Baden-Baden. Though each was meant to be performed on a separate concerts of the tour – they comprise a unified bundle. Each score makes use of a similar notational format and refers to the same legend, instructional modules, and musicians. According to Barrett, “the first set of fORCH scores served to short-circuit a process whereby FURT’s aims and methods would infuse the whole group” (Barrett, personal email to the author, 5 August 2016). The scores of fOKT I-III can thus be considered an entextualization of FURT’s improvised praxis. 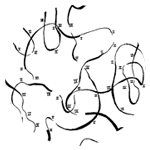 In my chapter on Ben Patterson’s Variations Double-Bass, I introduce the term entextualization as “the ‘process of rendering a given instance of discourse as text, detachable from its local context'” (Barber 2007, 30). In fOKT, as in Variations, improvised discourse precedes the written score; it is therefore important to consider how the score reflects and mediates rather than defines it. Ute Wassermann and Phil Minton are, of course, no ordinary singers. Their extraordinary command of noisy and extreme vocal techniques is a fundamental part of their work as improvisers, which both complements and extends FURT’s virtual manipulations of vocal samples. Another immediately recognizable mark of FURT on fOKT’s notation is the fact that Barrett and Obermayer nearly always play together; I recall their comments on synchronicity (2000) when remarking how much more often their modules coordinate in comparison with the parts of the other musicians. Although these signals may never have entered FURT’s microtradition, the group’s “attempt to articulate a message whose import remains out of reach” (2000) seems to be embodied in Barrett’s highly kinetic presence on stage.15 This is extended into fOKT not only through hand signals at the beginning or end of larger sections, but also in “coordinated modules” (see below) where Barrett and other members of the ensemble gesture to musicians spontaneously to trigger textural changes. FURT’s aims and methods are most deeply and dynamically reflected in fOKT‘s timeline-based score, with “tracks” that correspond to each player. The track notation shares in common with conventional notation a vertical distribution of parts that correspond to particular voices; players read their tracks from left to right. But unlike in conventional notation, material consists not of pitches, rhythms, and specified sound events, but rather of modules that refer to eight event types within which the players improvise for a rough duration. 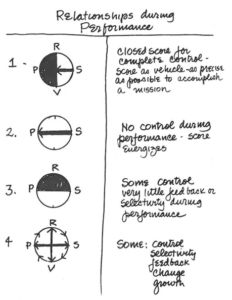 Event types include (1) Textures, which “describe a point of arrival or departure for a process” detailed on a case by case basis; (2) Duos, which link specific players as a subgroup within the ensemble playing one of two loosely defined material types; and (3) Coordinated Events, in which Barrett’s “unambiguous hand signal[s]” cue different types of designated behavior from “explosive bursts” to guided solos that suddenly change character. Event types (5-8) refer to microsocial relationships of a given player or subgroup to others in the ensemble. This category includes (4) Solos, (5) Accompaniments, (6) Perturbation, and (7) Transitions. Free improvisation is also included, represented by an infinity symbol (∞). (1-3) are often combined with (5-7). That the modules’ material, subjective, and intersubjective modalities overlap is a distinguishing feature of fOKT’s notation. 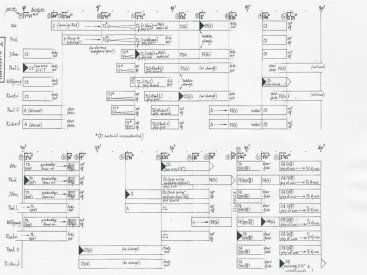 Timeline-based notations in general are common in notation for improvisers (see Bob Ostertag’s Say No More, Werner Dafeldecker’s Small Worlds (2004), or John Butcher’s somethingtobesaid (2008)). Asking performers to “do what you want here! And stop around here!” with loose guidance, as Minton suggests (see fn. 14), is indeed a practical and transparent way to compose for and/or with musicians who may not work, or wish to work, regularly with notation. But whereas Ostertag’s, Dafeldecker’s, and Butcher’s timeline notations simply describe who should play with whom and/or roughly what kind of material should be employed at a given point, Barrett’s case is more complex than Minton suggests.16 The majority of Barrett’s modules ask each performer to be aware of several levels at once (much as his through composed music does), and often multiple modules occupy the ensemble simultaneously. This results in a meshwork of cross-referenced sounds and contingent processes, potentially tethering the players in subtle and unpredictable ways. In fOKT the modules act as conceptual “samples”, assigned to the performers who “process” the material according to their own radically different methods and sound worlds. When multiple modules are played at once, and begin and end at different times, their individual identities are positioned for scrambling in the dynamic polyphony of the whole. The kaleidoscopic mashup that is likely to ensue – a FURT trademark – is different in kind from the effects of notation and sampling in Say No More, for example. Despite all the ways in which Ostertag distorts and recontextualizes material through processing and transcription, he maintains the identities of the four instrumental voices consistently. Furthermore, he reinforces their integrity through a vocalist/rhythm section dynamic – something rather unthinkable in fOKT, where individual identities are perpetually refracted. What this operation makes visible is that the feedback of FURT’s microtradition remains in movement, and the score emerges from it: an invitation to collaborate on a concrete question. This is a far cry from modeling the first stages of fOKT‘s inscription as the linear process (R) → (S), which suggests that (R) becomes frozen or absent during (S). Neither of these is the case, as FURT’s work grew from within the process of composing and performing fOKT; indeed one may infer from Barrett and Obermayer’s comments that this was precisely the point of the project. In my discussion of the explanatory potential of The RSVP Cycles above, I claim that in order to understand the social dynamics of a score for improvisers, one must look beyond notation to the contingent particulars of its use. In the case of fOKT‘s rehearsal process, (V), this is a difficult standard to uphold. I was not myself a performer or composer of fOKT (as I am in most pieces included in Tactile Paths), nor did I perform ethnographic research in Baden-Baden in the week prior to the premiere. Furthermore, there is no extant documentation of this phase to work with (as there is for The Sea Ranch). I shall thus offer a few brief speculations on what (V) might have entailed, working forward from the structure of the notation and backward from subsequent steps that I can observe in recordings. The notation is sufficiently complex that it would have required the performers to study the score, both in order to memorize the nomenclature, and to understand how their own modules linked to other players. But the pace of change between the modules in individual parts is not so fast that it would have required substantial, if any, individual practice. Barrett was of course also present during rehearsals as a performer, so other performers might have shortened the learning curve by clarifying doubts with him personally. Indeed, it seems clear that the notation is geared toward group learning, and (V) would have occurred mostly in the context of playing together. Here I would like to address how ensemble performance of fOKT traverses the RSVP cycle in both rehearsal and concert performance. In the same way that I nested FURT’s ongoing microhistory, or ur-cycle, in (R), it seems appropriate to nest another feedback loop in (P). We assume again the performers start with (S). In a conventionally notated score whose material is given, performers generally proceed to (V) (in dialogue with (R)) on the way to (P), as I explain in my expansion of Halprin’s Bach example. 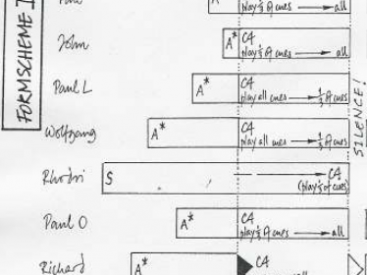 Even though Amirkhanian’s graphic score Serenade II does not prescribe materials, it shares the same path, for according to him and Halprin its indeterminate symbols are in any case semantically “interpreted” directly as sound and action. While the bandwidth of possible interpretations is perhaps wider in Serenade II than in the Bach example, movement on the RSVP cycle is the same in both cases. fOKT is different because of the multivalent nature of its modules, in which players choose the material themselves. The path therefore first passes back through (R). (R) here consists not only of the inventory of conditions that I mention above, and FURT’s ongoing practice, but also the resources of the ensemble. What do these include? First and most obviously, they include the individual performers’ resources: the unique embodied sound worlds and methods for which they were invited to participate in the project in the first place. Even where material is given in the score – and sometimes, as with pure18 event types (4-7), it is not – it is so loosely defined that it acts more as a suggestion or filter on the performers’ own material, rather than as a prescription per se. Second, if the performer does not begin the piece with a solo (as Davies does in fOKT II), unpredictable activity in the rest of ensemble will also constitute an element of (R). To be sure, group interaction is usually present in any collective improvisation, but its centrality is unavoidable here when the score couples players to cues, specific subgroups, and group textures. 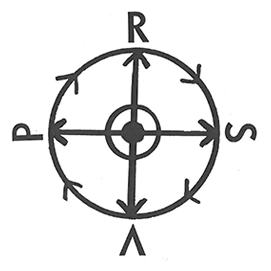 From (R), performers proceed to (V) on the way to (P). As I mentioned earlier, valuaction for an improviser can take place in real time as she mediates what she hears as she plays. In fOKT, (V) serves this function as well as managing the implementation of processes that pass through (R). That is, the performer simultaneously evaluates and acts on both the contingent and empirical aspects of (R) I mention above, and the indications of the score that condition them. This dual function of (V) may manifest in simple tasks, such as checking in with the timeline in the middle of an ongoing module. Due to the internal multivalency of the indications themselves, it may also manifest in more complex tasks, such as negotiating when to make a given transition, or how to “ignore” another performer who is instructed to “interrupt” (see Wassermann’s and Minton’s first modules in fOKT I). (P) itself may be thought of as a complex intersection and recontextualization of all the paths I have just described: the concrete materialization and interaction of individual (R)s and (V)s. The richness of this step in the cycle, the musical “now” so to speak, again challenges Halprin’s own characterization of his model, in which he defines performance as “the resultant of scores and […] the ‘style of the process'” (Halprin 1969, 2). His definition suggests a linearity and fixity which, in my opinion, is fundamentally at odds with the dynamic structure of both the cycle and performance. After all, if one conceives of performance as the end of the cycle or a mere “style of the process”, the RSVP cycle might as well be an RSVP line segment. The central feedback loop that occurs in (P), (V → P → R ↺), has also occurred over the life of fORCH; the ensemble’s “collective spaces of possibility” (Beins 2011) – its microtradition – has outgrown both the overt influence of FURT and the use of elaborate notation. As one may see, the scores of fOKT VI and spukhafte Fernwirkung (co-composed, it should be noted, with Obermayer) are so bare as to be hardly necessary; like Barrett’s codex VII, they serve more as mnemonic devices than as genuine interfaces. Minton’s recollection of spukhafte Fernwirkung is revealing: “From what I can remember of richard and pauls [sic] piece it was like above [“do what you want here! And stop around here!”] and all the cues where [sic] audio” (Minton, personal email to the author, 2 August 2016). The role of notation in these projects was so minor, in fact, that Barrett was unable to fulfill my recent request for a copy of fOKT V because he had lost them! Nonetheless Barrett and Obermayer have remained members of the ensemble, and fORCH, in theory, lives on. What lessons about notation, improvisation, and collectivity can we draw from the examples of fOKT and The Sea Ranch? In both cases, scores “energize” the collective creative process (Halprin 1969, 191); they stimulate and condition group interaction. However the nature and degree of the notation’s impact on the process changes over time. At the beginning of the process, scores tend to have a more active role, directly mediating interaction between individual participants, or between the participants and other contingent elements of their performative environments. As the process evolves over time, however, activity energized by the score takes unpredictable turns and follows its own trajectories. That unpredictability stems not only from microsocial dynamics within the group, but also from factors not represented in the score – particularly the higher order socialities in which the creative process is embedded. Local feedback between participants becomes enmeshed with larger-scale environmental feedback, generating situational structure that diminishes the importance of the notation. Nevertheless, participants still use scores to agitate and reflect on the process in later stages. In fOKT, Barrett articulated his position of power in the creative process by entextualizing FURT’s performance practice. He then removed himself from it by setting up and taking part in a process of collective recontextualization. As a consequence, the resources produced through the performance of the process – multiple concert performances and recordings of fOKT – were severed from Barrett’s authorship and gained a life of their own. fORCH lives on, and in addition to having stimulated FURT, its legacy is a testament to the socially constructive power of scoring. What could the position on notation for improvisers in collective settings be now? Pay attention to what performers already play and how it has affected individuals and community. Notation should be considered as a path of action, as well as a form of thought; in Cobussen’s words, an “invitation to make music together” (2016). Examine how existing microsocial patterns can be experienced and understood in new contexts, to be criticized, advanced, countered, but not simply disregarded. The fruitful interchange between theory that is thought differently and theory that has familiar resonances can bring spirit to music most effectively when it connects to what musicians have already invested there. Invitation + Question + Response = Collaboration = Liberation. Q.E.D. Richard Barrett (personal email to the author, December 12 2015). Lawrence Halprin (Halprin 1969, 4). Henceforth I will place The RSVP Cycles in italics to refer to the book itself – Halprin 1969. Where it is not capitalized and italicized (i.e. 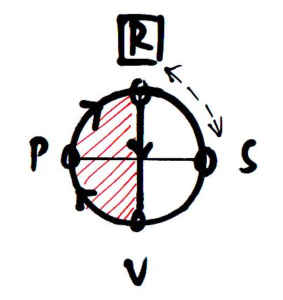 “RSVP cycles” or simply “cycles”/”cycle”), I refer to the model contained in the book. Furthermore, the undoing of The Sea Ranch, as Halprin and his collaborators imagined it, reminds us of the difficulty of translating collectivity in sheltered art contexts to collectivity in the world of late capitalism that envelops them. Barrett and Obermayer tend to downplay the role of technology in their work, often underlining the group’s humble origins: “At that time  our instrumentation consisted of such things as electric guitars, trombone, percussion, crumhorn, synthesisers, voices, cracklebox, vacuum cleaner, effects pedals, cassette recorders, and anything else within reach, which we improvised on and overlaid in various extremely low‐tech ways; live performance as a duo would have been almost impossible and definitely precarious, but an aesthetic was emerging through the murk of bad amplification and tape‐hiss […]” (2000). Despite their allergy to technophilia, however, it is useful to examine the close connection of FURT’s present instrumentarium to their performance practice: three networked laptops and identical MIDI keyboards and faders at a shared table. This clearly supports the idea that the group works “as one person rather than two” (Barrett and Obermayer 2000). The significance of this in the context of the scores for fOKT will be addressed below. Barrett notes that the duo’s identity is also “invariably treated as a single unit by Evan Parker in the schematic scores for his Electroacoustic Ensemble” (Barrett, personal email to the author, 23 August 2016). 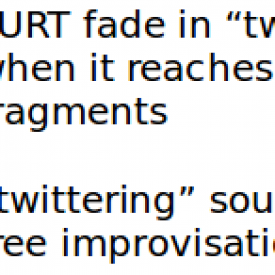 For a discussion of these strategies, which Barrett calls “seeded improvisation”, see Barrett 2014. For more on this note, see “Thatcherism, Big Brum, ‘Existence'” (Bond 2013), an interview with playwright Edward Bond, whom Barrett cites below. Six versions in total were written between 2005 and 2009. In 2012, Barrett also co-composed a piece with Obermayer for fORCH entitled spukhafte Fernwirkung. According to Barrett, Kager was at the time “in charge of the jazz department at SWR; one of his last acts there before the restructuring of the company impelled him to resign and return to his home two of Vienna was the commissioning of spukhafte Fernwirkung, so that he’s been involved in fORCH for its whole history so far. The inclusion of Wolfgang Mitterer in the original lineup was his idea. I hadn’t met Wolfgang before the initial sessions but was aware that his work in some ways followed a comparable path to my own” (Barrett, personal email to the author, 23 August 2016). As we will see below, Kager’s organization was a crucial factor in the evolution of the project, and can be very much considered a “Resource” in the RSVP cycle. To clarify: I consider notational and/or aural complexity to be neither a virtue nor a vice; it is simply a unique feature in this case. I should also point out that the simpler notation in Ostertag’s, Dafeldecker’s, and Butcher’s pieces do not necessarily result in simpler music. By “pure” I mean not combined with event types (1-3), as in T1(A), the second module of Barrett’s and Obermayer’s part in fOKT III. Bailey, Derek. 1987. “Soundcheck.” The Wire, February. ———. 1993. Improvisation: Its Nature and Practice in Music. Boston: Da Capo Press. Barrett, Richard. 1999. Transmission. Suffolk: United Music Publishers. ———. 2002a. Blattwerk. Suffolk: United Music Publishers. ———. 2002b. “Blattwerk: Composition / Improvisation / Collaboration.” http://richardbarrettmusic.com/BlattwerkEssay.html. ———. 2005. fOKT. Unpublished score. ———. 2011. “Construction of CONSTRUCTION.” http://richardbarrettmusic.com/CONSTRUCTIONessay.pdf. ———. 2014. “Notation as Liberation.” TEMPO 68 (268): 61–72. doi:10.1017/S004029821300168X. Barrett, Richard, and Paul Obermayer. 2000. “Response to Questions from Nic Collins for Noisy.org.” http://furtlogic.com/node/7. Beins, Burkhard. 2011. “Scheme and Event.” In Echtzeitmusik Berlin: Selbstbestimmung Einer Szene | Self-Defining a Scene, edited by Burkhard Beins, Christian Kesten, Gisela Nauk, and Andrea Neumann, 166–181. Hofheim: Wolke Verlag. Borgo, David. n.d. “Entangled: The Complex Dynamics of Improvisation.” https://www.academia.edu/22893440/Entangled_The_Complex_Dynamics_of_Improvisation. Boulez, Pierre. 1990. Orientations: Collected Writings. Edited by Jean-Jacques Nattiez. Translated by Martin Cooper. Cambridge, MA: Harvard University Press. Canty, Donald. 2004. “Origins, Evolutions and Ironies.” In The Sea Ranch, edited by Donlyn Lyndon and James Alinder, 22–33. New York: Princeton Architectural Press. Cardew, Cornelius. 1969. “A Scratch Orchestra: Draft Constitution.” The Musical Times 110 (1516): 617. ———. 1972. The Great Learning. Leicester: Experimental Music Catalogue. Castillo, Greg. 2015. “Hippie Modernism.” Places Journal, October. https://placesjournal.org/article/hippie-modernism/. Cobussen, Marcel, Henrik Frisk, and Bart Weijland. 2010. “The Field of Musical Improvisation.” Konturen 2 (1): 168–85. doi:10.5399/uo/konturen.2.1.1356. Dafeldecker, Werner. n.d. Small Worlds. 2004: Unpublished score. Fischlin, Daniel, and Ajay Heble, eds. 2004. The Other Side of Nowhere: Jazz, Improvisation, and Communities in Dialogue. Middletown, CT: Wesleyan University Press. Gergely, Liana. 2013. “The Process Made Visible: Anna Halprin’s RSVP Cycles in Creating Ceremony of Us (1969).” B.A. thesis, Barnard College, Columbia University Department of Dance. http://dance.barnard.edu/sites/default/files/liana_gergely_thesis_-_the_process_made_visible.pdf. Goehr, Lydia. 1992. The Imaginary Museum of Musical Works: An Essay in the Philosophy of Music: An Essay in the Philosophy of Music. Oxford: Clarendon Press. Haenisch, Matthias. 2011. “Emergence: On a Theoretical Term in Current Improvisation Research.” In Echtzeitmusik Berlin: Selbstbestimmung Einer Szene | Self-Defining a Scene, edited by Burkhard Beins, Christian Kesten, Gisela Nauck, and Andrea Neumann, 186–201. Hofheim: Wolke Verlag. Iddon, Martin. 2004. “The Haus That Karlheinz Built: Composition, Authority and Control at the 1968 Darmstadt Ferienkurse.” Musical Quarterly 87 (1): 87–118. John-Alder, Kathleen. 2014. “Processing Natural Time: Lawrence Halprin and the Sea Ranch Ecoscore.” Studies in the History of Gardens & Designed Landscapes 34 (1): 52–70. doi:10.1080/14601176.2013.850279. Kupper, Eugene. 1971. “Review Symposium: The RSVP Cycles: Creative Processes in the Human Environment. Lawrence Halprin.” Urban Affairs Review 6 (4): 495–498. ———. 2008. A Power Stronger than Itself: The AACM and American Experimental Music. University of Chicago Press. Lyndon, Donlyn. 2009. “The Sea Ranch: Qualified Vernacular.” Journal of Architectural Education 63 (1): 81–89. Lyndon, Donlyn, and James Alinder. 2004. The Sea Ranch. New York: Princeton Architectural Press. MacDonald, Raymond, and Graeme Wilson. 2005. “Musical Identities of Professional Jazz Musicians: A Focus Group Investigation.” Psychology of Music 33 (4): 395–417. doi:10.1177/0305735605056151. Nattiez, Jean-Jacques. 1990. Music and Discourse: Toward a Semiology of Music. Princeton: Princeton University Press. Nicholls, Tracey. 2012. An Ethics of Improvisation: Aesthetic Possibilities for a Political Future. Lanham, MD: Lexington Books. Sancho-Velázquez, Angeles. 2001. “The Legacy of Genius: Improvisation, Romantic Imagination, and the Western Musical Canon.” PhD diss., University of California, Los Angeles. Wooley, Nate. 2015b. “Mostly Other People Do The Killing Are Detained By Treatise.” Sound American 12. http://soundamerican.org/sa_archive/sa12/sa12-the-treatise-performances.html. Worth, Libby, and Helen Poynor. 2004. Anna Halprin. Routledge. Zorn, John. 2002. Cobra. CD. New York: Tzadik TZ 7335.